Ever wonder how your going to use math in your life? Well if you are in Grant’s class this year he answers that question with a project every 6 weeks. 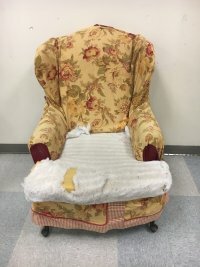 This time the project is to reupholster a chair cushion for their classroom. The students will have to pick a scale factor to size down their drawings of the actual chair to paper. The will have to do all the measurements and draw it to scale. The students have loved the projects they have worked on so far and they are excited to start another one. We will keep you updated on their project over the next 6 weeks as they work on the drawings, measurements, and the final seat cushion.